It is easy to get caught up in strategy, tactics, metrics, ROI, and all that. But remember, the health interventions you cultivate can be life changing, life-saving. This is especially true for heart health and other chronic diseases. Let that sink in a bit. You should feel good about your contributions! If you haven’t done it yet, take a minute and watch the featured video testimonial on this page. You’ll be glad you did. 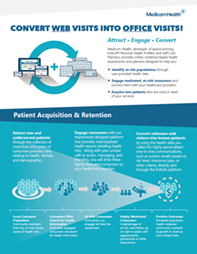 Adventist HealthCare posted it on their blog a while back. Their “Healthcare & You” micro-site does a great job of focusing on patient journeys. For those that skipped it, a woman credits an HRA on Adventist’s website with saving her life. That is pretty much a direct result of hospital marketing decisions. Of course, the video is very motivational to potential patients. In other words, the video itself could save more lives. Pretty cool! The best kind of virality. But it should also be inspirational to health care marketers. Creating “aha moments” is what the best health care marketing does. That is critical today. Health care will only improve if patients improve their health awareness. Here at Medicom Health, we are one more step removed from the marketers and the patients. But I like to remind our staff of the good work our marketing clients are doing. I want them to understand the small part they play in these patient stories. It is rewarding to know that the products we make result in longer, happier lives. “Thank you” to all the hospital marketers that make this possible. Let us know if there is anything else we can do for you.